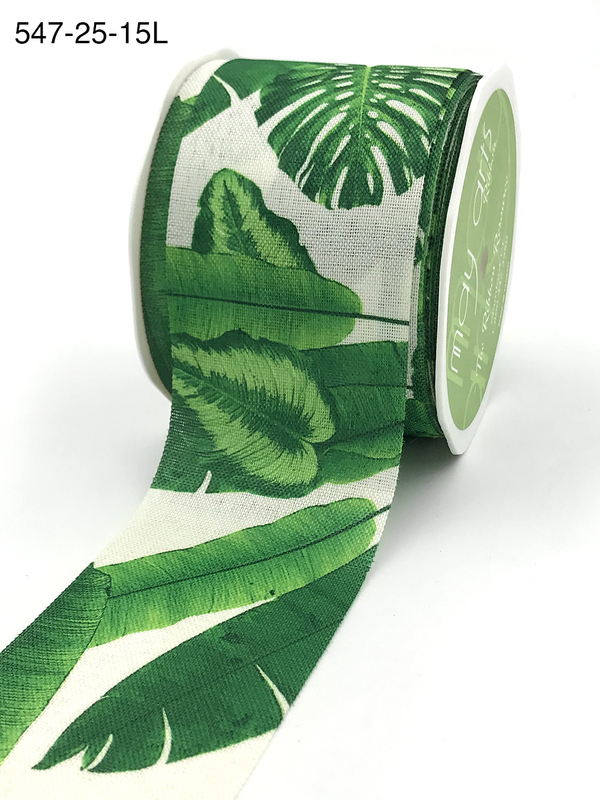 This 2.5 inch by 10 yard ribbon is a large scale tropical leaf print. The leaf print comes on either a shiny and sleek fabric similar to our 364 Series in the blue hue, or a soft faux linen in the green hue. The faux linen fabric has an ivory background making this green leaf print have a natural vibe, both with its feel and look. The Miami Vice fashion trend is punctuated by a mix of soft and bright shades, bold patterns, and lots of color blocking. There are few things more synonymous with summer than a palm tree. Palm leaf and banana leaf prints are popping up everywhere in fashion. They exude the cool sophistication of trendy vacation spots in locals like Miami. The printed pattern is single-sided. The wired edge on this blue patterned ribbon allows you to bend and create bows with ease. We love this Oversized T-Shirt project using our palm prints.